Pride is such a tricky, sticky little thing. And, I have a lot of it. I always have. You see, I learned at a young age to be good. I was the girl who was known as a goody two shoes in elementary school, and a killjoy in high school. I was a “super godly girl” in college and a church loving, good-clinging young adult. I was so proud of myself. Once I had birthed a few babies and had figured life out a little bit better, I realized that perfection isn’t what people want in a friend or a wife or a mother. And, I began to confess my imperfections. I began to reveal some of the ways that I really did not have it together. It was terrifying and freeing. And, it left a little room in my good little life for demonstrations of God’s grace. I was finally able to see that any good in me was the result of what God was doing, not my iron-willed resolve to be the good girl. Yet, even now, pushing 40 years old, I feel that pride creeping back in all kinds of ways. One of those ridiculous ways is the old car that I drive. Now, my minivan is 10 years old. It’s not really that old in regular car years, but in minivan years, that’s more like 25 years. This thing has been puked on, spilled in, sprayed by multiple skunks, has peeling paint all over it and a crusty pro-life bumper sticker on the back. I’m telling you, it’s the ultimate super godly mom mobile. And, I look at that once shiny car (which I love–heated seats, y’all.) and I just feel myself getting all prideful that we aren’t spending money on a nicer car. Pride can go that way, too, you know. Some people have pride in their nice cars. And some have pride in their old ones. And, both are wrong. The things we have, things we own, things we use… who cares how much they cost or what brand they are or if we’re minimalists or big spenders? We have no room for pride in anything in our lives–nothing, I tell you, but in the cross of Jesus Christ. That is worth bragging about. That’s worth talking about. The mission of Christianity is worth putting money into. And, the rest? We have no talents. They all belong to Jesus. We have no possessions. They’re all His. We have no abilities. Just what He does through us. We have no reason to be proud of ourselves. Strip away what belongs to Him, and what are we left with? Just our sin. Not really something to be bragging about. So, before I and the rest of you super godly greats out there start getting all starry eyed about what we have and what we don’t have and what we do and what we don’t do, let us all remember that what we really are, without Jesus, is just a big ball of sinful mess. And, you can’t dress that up with a Cadillac or make it look a little more endearing with a crusty minivan. When we get caught up in our goodness, we feel proud of ourselves. Look at what we put on Facebook. Just take a look at how quickly we brag on our good decisions. 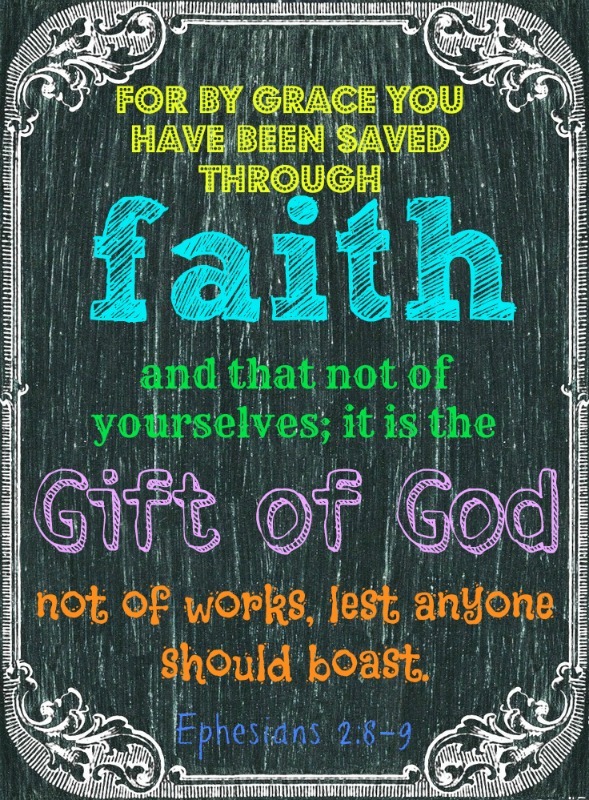 Look at how often we boast in our own good works, as if we are especially good underneath the gracious blanket of Jesus Christ that mercifully covers us. Our pride is killing us as much as all of those things we haughtily refrain from doing would. But, somehow we consider it righteous to be proud of ourselves. I would never read that book, we say. I would never spend that kind of money, we boast. I would never think that way, we post on Facebook. And, before we know it, we look back at our social media activity, and we see it. We are so very proud of ourselves. Believe me, I speak to you as the Pride Queen. But, please hear me when I tell you that we have got to stop trying to steal glory from God by enjoying our own goodness. We were made to glorify God and enjoy Him forever, and we settle instead for trying to convince ourselves that we are pretty great, too. He alone is good. He alone is worthy. He is the only source of light. In Him is no darkness at all. In me? Darkness. But, He chases it away with His holiness and righteousness. And when He does that? All I can seem to do is pat myself on the back. Listen, I’m not arguing the greatness of being good. God gives us real choices. We have the responsibility to choose according to His word. Sometimes we do that well, and sometimes not so well. But, our sanctification as followers of Christ is not our doing. We can reach for it (because the Holy Spirit puts the desire in us), we can ask for it, and we can endure the process of being changed and refined in heart and soul, all of which is accomplished by God. He allows us the chance to participate in that growth. But, whatever good we do is only the result of His goodness inside of us. So, today, I would like to lay down (again) the pride that loves entangling me, and I pray that Jesus will shine through me despite my tendencies to try to turn off the sunshine of His goodness and turn on the fluorescent bulb of mine. All honor and glory is His. Originally posted March 9, 2014. What would Jesus do? 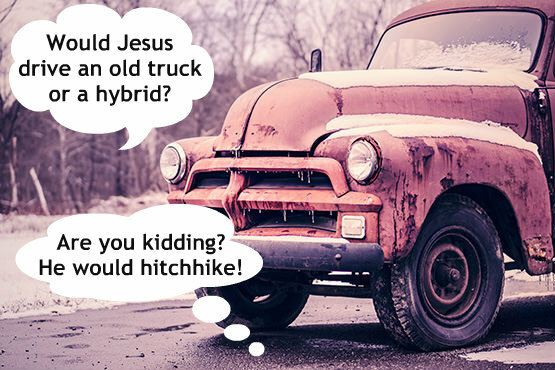 Believe it or not, this question, which basically became a joke to most Christians after it graced every t-shirt, bracelet, and bumper sticker for awhile, has now become a serious and essential question of the Christian faith. I’ve seen it asked in all kinds of contexts, and usually those of us who are quick to answer it seem to feel as if we have a direct line to Jesus’ brain that tells us in any and every situation how Jesus would handle things. The fact is that we can never know with all certainty how Jesus would handle anything because He is God, and the Bible clearly tells us that His thoughts are higher than our thoughts and His ways are higher than our ways. Yes, we can see His character played out in Scripture. But, we see Him both rebuke and forgive. We see Him love and we see Him feel righteous anger. We see him humble himself as a servant, and we see Him exalted at the right hand of the Father. We see Jesus eat with sinners, and we see Him meet with religious leaders. We see Him combat Satan in the desert and we see Him stand silent before His accusers in the courts. We see Him healing the masses and we see Him allowing His friend to die. Jesus is a highly complex, completely perfect, holy in every way God and man. He is beyond our comprehension and yet is completely accessible. But, what Jesus would do cannot be reduced to one simple always-the-right-answer idea. The truth is that Jesus, complex as He is, complicated as His calling is, could and would do any number of things in any given situation. Yet, we talk about Him as if we have a window to His own thoughts. We would do better to humble ourselves and admit that we might not be exactly sure what Jesus would do in every situation, but we know that whatever He does is good, is holy, and is perfect in every way. Maybe instead of asking what Jesus would do, we should stop dealing in the world of hypotheticals and instead ask the tougher question: What would Jesus have me do? And, then we start getting someplace in the run toward holiness. And, although I can guess as to the reasons that a person would tell himself that he should painstakingly place this message on a sign for thousands of passing cars to see, as the mesquite trees zoomed by outside my windows I just couldn’t stop cringing. 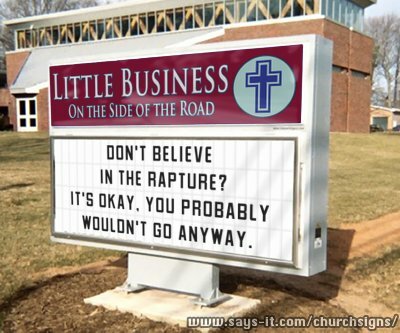 Because regardless of your “rapture” stance, the heart of the message wasn’t really about a rapture or whether or not you should believe in it. The sign was really about pride. The truth is that the person who hand placed each of those letters did it because he is proud of his decision to become a Christian. He is so proud of his intelligence or his spiritual prowess or his own humility. He is proud that he believes in God, and he thinks if you don’t believe then you are lacking in intelligence or you are just stubborn or prideful or you are a bad decision maker. But, he and his fellow Christians? Smart, compliant, humble, good decision-makers. There’s only one problem with that way of thinking. It’s not biblical. The reality is that we have nothing, I mean NOTHING, to be proud of when it comes to our salvation. If we were left to our own devices, even the most sincere believer among us would’ve walked a path straight to hell. Because our hearts are bent toward evil and wrong-doing. (Jeremiah 17:9) And, only God can change hearts. Not us. I suppose the real reason that I cringed for miles after I saw the sign is because I know what it feels like to have pride lurking around inside of me. I know what it is to be blindsided by a hunger for some of the glory that belongs to God. I understand the temptation to take credit where it isn’t due, to point to my abilities instead of God’s greatness, to really feel in some deep part of my soul that I have done something to help save myself. 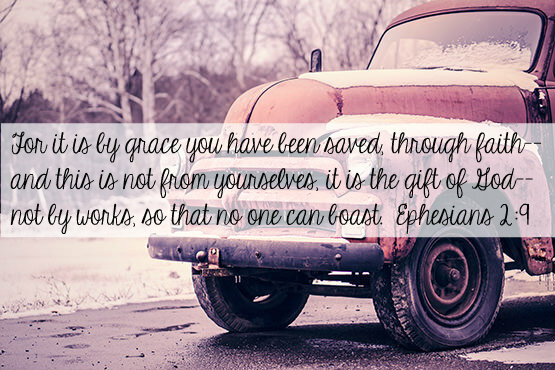 Maybe we all feel a little sense of misplaced pride in our salvation. Man, that really sounds a lot like Christianity sometimes. We love our goodness. We love our Christian-ness. We love our slightly superior views of ourselves. Maybe instead of putting up signs that mock the lost, we should pray that we would become a walking billboard that says, “Saved by grace. Nothing more.” Something tells me that’s a much more inviting way to try and show people that they, like us, need Jesus. Our mail lady refuses to wave at me. I mean, seriously. She will not wave, she will not say hello, and she will not smile. I have made it somewhat of a personal mission of mine to make her love me. Yes, I said it. I need the love and approval of my mail lady. The other day I saw her at the gas station, of all places, and I thought I had found my moment. It was an out-of-context opportunity. I just knew that she would be so thrown off by seeing me out of my normal place that she would be caught off guard and would wave and smile despite her obvious disdain for my face. So, I smiled the biggest, toothy grin I could muster, and I waved in a nonchalant, yet slightly desperate way as she started to back her little mail truck up to the pump. She appeared to look right at me. Yet, she sat, stone-faced. Not even a hint of joy in her mysteriously aloof eyes to make me feel that deep down she doesn’t hate me. I felt a little humiliated, and I got in my car. I waited for her to get out of her truck, but she stayed inside, just sitting there. Well, then the conspiracy theories started in my brain. The thought occurred to me that she must be sitting in her little truck waiting for me to leave so that she doesn’t have to interact with me. I began imagining all of the various reasons that she could dislike me. I actually began to worry that the fairly mediocre giftcard we had given her for Christmas was expired when she went to use it. I thought, What if she thinks I purposely gave her an expired giftcard? I even texted Chad and told him I thought she was holding a grudge over her Christmas gift. I was only half joking. I was starting to obsess over this lady’s bad attitude. I was stressed out about the imagined situation that I had created in my mind. In fact, the mail lady probably has a one-track mind. She is probably focused on mail when she is working. She may not have even been looking at me at the gas station. She may have been sitting in her truck texting before she pumped her gas. Mail ladies do text. Mail ladies also get distracted by various issues going on in their lives. Mail ladies DO NOT HAVE TO ENJOY TALKING TO ME. Does that mean she hates me? Or that she doesn’t like me? Or even that she notices me at all? I realized that I was being sensitive. Now, there is good sensitive and bad sensitive. Don’t talk about the baby’s weird diaper in front of someone who vomits easily. Don’t ask your pastor if he noticed how many people slept through his sermon. Do ask the little old lady at church how her fungus-infested cat is doing. Do give your husband the opportunity to cry in private when his team loses. Get offended because the shaky-handed new employee at McDonald’s “purposely” forgot your ketchup. Get up a gossip campaign among your friends over something you think someone might have been thinking once. Choose to dislike people you’ve never spoken to because they never speak to you. Get crazy about the fact that your mail lady hates you when she has never indicated in any way that thinks about you one bit. Oh, man. I have been attributing feelings to my mail lady that she has probably never had in her life. I have given myself a complex about it. I have had unpleasant feelings about her when she has really and truly done nothing wrong at all. She has faithfully delivered my mail. She hasn’t left dog poop or half-eaten watermelon or rotten tomatoes in my mailbox. She has never hollered obscenities at my cheery red door as she stops by. She has never even glared at me or told me to quit smiling at her or stuck out her tongue. She just does her job. She is neutral. And as far as I know she has no ill feelings toward me at all. Only in my sensitive-in-a-bad-way mind. And, I know I’m not the only one. We live in an overly-sensitive society. We all feel that everyone is looking at us, intending to slight us, purposely hurting us. We are so hyper offended. In fact, we are self-centered. We are spoiled. And we are more interested in our own feelings about things than in other people. If I start devoting as much time to praying for my mail lady as I have fretting about what I don’t even know she is thinking about me, imagine how I could be a blessing in her life. Even if she never speaks to me. I can still bless her. And I should. That is Christianity! Love. Love, the Bible tells us, not obsessing over all the ways we’ve been offended this week. Let’s try something new. Let’s give others the benefit of the doubt. Let’s let the reserved mail ladies of the world be who they are, and let’s not get mad about it! The next time we start feeling that prideful sensitivity bubbling up inside of us, let’s remember that that thinking is poison. It ruins relationships. It hurts others. And it causes us to make much of ourselves. Now, if you are mad at me after reading this, you are probably in sensitive-in-a-bad-way mode. You believe I am talking about you. You are certain that I am using this post as a way to send you a personal and offensive message. But, I’m not. I’m just delivering the mail.